. :: FEAR OF FALLING & KNOWING HOW TO FALL ::. The best way to cope with fear is not to generate it to begin with. A good coach will try to make sure you largely avoid bad experiences. They will do this by continuously assessing your performance and building on your achievements progressively. At every stage you should practice good-quality work until it feels natural. When it is natural, you do not have to worry about your responses to situations, because they will be automatic. This is the best way to avoid accidents and the fear that often follows. A valuable technique to help overcome your fear of falling is to learn how to vault on and off a horse—this method allows you to spring up onto a horse, without the aid of a mounting block or a leg up, and to spring off a horse when it is cantering. Knowing that you can get on and off a horse even when it is moving will help you feel more in control and less afraid of taking a tumble. The fear of falling off a horse can also be reduced by learning what to do should you ever find yourself in that situation. This is a positive strategy that will benefit the vast majority of riders because all riders do have falls—albeit more infrequently if you are better trained. If you do have a fall, the key is to get your feet out of the stirrups and allow yourself to be thrown away from the horse. Then put your chin on your chest, curve your back, tuck up your legs, and be ready to roll. 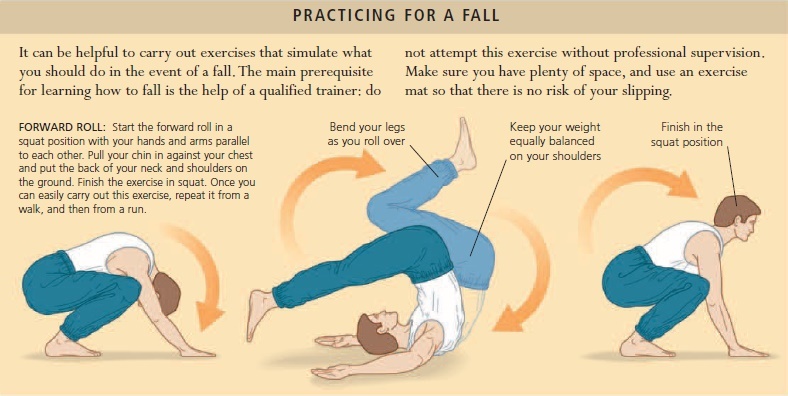 It is a real advantage to practice techniques to help you learn how to fall (see box, below). 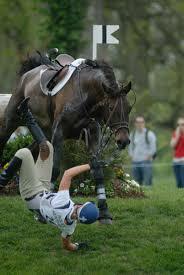 Knowing that you can land safely and avoid injury will make you less nervous about riding. Of course, regardless of this preparation, every effort should be made to avoid falls in the first place by the use of safe exercises, by riding horses with good temperaments, and by following rules and exercising self-control. Look down at the photos to see with illustrations on Practising How to Fall.